Colonel Timothy Reese recently wrote a devastating memorandum, quoted in full at ForeignPolicy.com, regarding actual conditions in Iraq from a realistic military perspective. COL Reese should know — he’s the chief of the Baghdad Operations Command Advisory Team, Multinational Division-Baghdad, Iraq. Before deploying to Iraq, Colonel Reese served as the director of the Combat Studies Institute at Fort Leavenworth, Kan., the Army’s premier intellectual center. He was an author of an official Army history of the Iraq war – “On Point II” – that was sharply critical of the lapses in postwar planning. The memorandum, sent by e-mail, was supposedly intended for a small audience. However, it appears that no significant effort was made to restrict it’s circulation. It has been posted in full on at least one military-oriented blog, and COL Reese himself apparently posted parts of it on another blog (since removed). As the old saying goes, “guests, like fish, begin to smell after three days.” Since the signing of the 2009 Security Agreement, we are guests in Iraq, and after six years in Iraq, we now smell bad to the Iraqi nose. 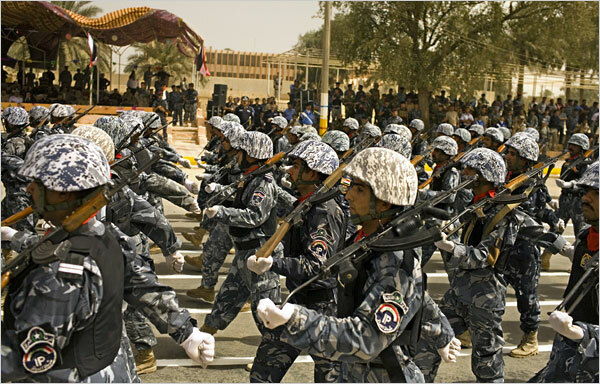 Today the Iraqi Security Forces (ISF) are good enough to keep the Government of Iraq (GOI) from being overthrown by the actions of Al Qaeda in Iraq (AQI), the Baathists, and the Shia violent extremists that might have toppled it a year or two ago. Iraq may well collapse into chaos of other causes, but we have made the ISF strong enough for the internal security mission. Perhaps it is one of those infamous paradoxes of counterinsurgency that while the ISF is not good in any objective sense, it is good enough for Iraq in 2009. Despite this foreboding disclaimer about an unstable future for Iraq, the United States has achieved our objectives in Iraq. Prime Minister (PM) Maliki hailed June 30th as a “great victory,” implying the victory was over the US. Leaving aside his childish chest pounding, he was more right than he knew. We too ought to declare victory and bring our combat forces home. Due to our tendency to look after the tactical details and miss the proverbial forest for the trees, this critically important strategic realization is in danger of being missed. In 2002 and early 2003, during the build-up to the U.S. attack in Iraq, my focus was on the impending military action. I felt that forcibly deposing Saddam Hussein was justified, and I still do. I claim no prescience from those days, but it did occur to me several times that once Saddam was gone there was going to be a real mess in Iraq. I wondered how, or if, anyone could keep Shi’ites and Sunnis from murdering each other, and I thought that the Kurds might find themselves between a rock and hard place — between the Turks on one side and the Shi’ites and Sunnis on the other. I didn’t dwell on the difficulties that would be encountered in post-Saddam Iraq, and apparently most other people didn’t, either — including the Secretary of Defense. Our armed forces performed brilliantly in taking down the regime of Saddam Hussein, achieving victory very quickly with few casualties. That was to be expected; that’s how good they are. When President Bush made that much-maligned “Mission Accomplished” declaration, he was right. The mission was to defeat the Iraqi regime and depose Saddam and his henchmen, and that mission was clearly and decisively accomplished. We might call that “Phase One” of the overall U.S. military involvement in Iraq. Phase Two began going to hell quickly. In the years since, the American Army and Marine Corps have once again been stuck in a third-world mess trying to “win hearts and minds” while keeping violent, murderous people under control. The fault lies with our politicians for letting it happen, our senior military leaders for not objecting sooner and more loudly, and the rest of us for mostly going along with this insanity. COL Reese isn’t the first senior officer to speak truth to power about the war in Iraq, but unlike some others, he has done it while he’s still on active duty, and the truth he tells is completely unvarnished. Even if you’ve given up on reading and hearing about the Iraq War, you must read what COL Reese has to say. You’ll come away sobered and more convinced than you may have already been that it’s time to get out of Iraq. [W]e should declare our intentions to withdraw all US military forces from Iraq by August 2010. This would not be a strategic paradigm shift, but an acceleration of existing US plans by some 15 months. We should end our combat operations now, save those for our own force protection, narrowly defined, as we withdraw. We should revise the force flow into Iraq accordingly. The emphasis should shift towards advising only and advising the ISF to prepare for our withdrawal. Advisors should probably be limited to Iraqi division level and higher. Our train and equip functions should begin the transition to Foreign Military Sales and related training programs. During the withdrawal period the USG and GOI should develop a new strategic framework agreement that would include some lasting military presence at 1-3 large training bases, airbases, or key headquarters locations. But it should not include the presence of any combat forces save those for force protection needs or the occasional exercise. These changes would not only align our actions with the reality of Iraq in 2009, it will remove the causes of increasing friction and reduce the cost of OIF in blood and treasure. Finally, it will set the conditions for a new relationship between the US and Iraq without the complications of the residual effects of the US invasion and occupation. Source note: ForeignPolicy.com, launched in January 2009, is the new website of Foreign Policy magazine. The magazine and website are now published by the Slate Group, a division of Washingtonpost.Newsweek Interactive, LLC. -It’s still incomprehensible to many people WHY this was the mission. -This is so true. The whole situation is unwinnable. Staying in Iraq any longer will only make many people in the Middle East even angrier. Clarissa, according to ordinarily very reliable British intelligence, Hussein had his hands on yellow cake (uranium ore). He had been thumbing his nose at UN weapons inspectors almost before Gulf War I was over. There were a variety of reasons given. Like you, I was dubious of much of it. We have been warned innumerable times to avoid ground wars on the Asian land mass. We ignored those warning for Korea, Vietnam, and now Iraq and Afghanistan. So far with this campaign, we’ve been fairly lucky that our losses have been so minimal. In the grand scheme of things, our losses have been “acceptable.” We lost more Americans at Gettysburg in just a few days than we have since we invaded Iraq. Most of our losses in Vietnam were between 1966 and 1972. We lost more in a given year over there than we have in 6 – 7 in Iraq. In 1943, at the Battle of Kursk between the USSR and Germany, reports indicate over 500,000 killed in action in about a month. In WWII, we had about 650,000 killed in action in 3 1/2 years of fighting. Comparable numbers for today would have us at a staggering 1.1 – 1.2 million killed in action in the ME. One serviceman killed over specious reasons is one serviceman too many. I don’t believe any of our servicemen and women have died over there for specious reasons, though I would have preferred much better reasons for our involvement over there. It was a tough call. Bush made it. As much as I despise Clinton and our current president, I expect that they probably wouldn’t have done things too terribly differently than Bush given the same circumstances. Ron Paul was roundly criticized for his comments on what has gotten us involved over there (meddlesome foreign policy), but he was right. I cannot disagree with the Monroe doctrine, but extending the Monroe Doctrine to cover the entire world is a mistake that nearly every administration since Woodrow Wilson has made. It has harmed us more than it has helped us. And trust me when I say that I was none too happy with Bush as president (either one of them). I say get out, never should have gone there. Just who would you like as president, Brian? I dare say no one could ever measure up. I guess I should say, charge few enough taxes. One more soldier killed in Iraq is way too many, for no reason at all, now. I’d be happy with Ron Paul, Harry Browne, Michael Badnarick, Bob Barr….